These are the Original BlueSky Furled Leaders.We have been crafting furled leaders since 1999 and have mastered furled leader making.Made in the USA but born on the storied chalk streams of the British Isles, furled leaders were first crafted of horse hair and later of silk. Now they are hand-woven from over 90 feet of premium nylon, providing legendary performance.All of our furled leaders are pre-looped to attach to the fly line using the simple loop-to-loop method. 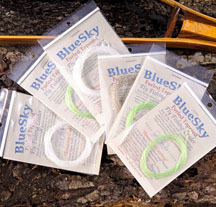 This means if the conditions change, or you wish to use a different fishing method, you can switch to another BlueSky Furled Leader in seconds. 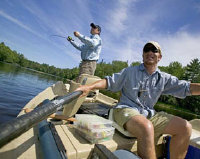 From panfish to trout to musky to redfish to tarpon, we have the perfect furled leader for your fishing. We are celebrating our 20th year in business with a year long sale. Use code 20yr at check out for a 20% savings.